I really enjoyed this book, but it was a bit depressing. 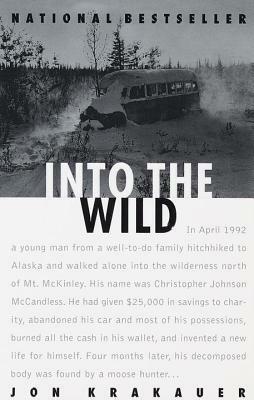 It really gives me pause and makes me think about how many people are out there like Chris McCandless. If he had chosen any other place he might still be alive today….but what would he be like? How many people do you know that march to a beat of a different drum? So many of those people who do so are geniuses in disguise. If we don’t find an outlet for the thoughts that go though our minds, what happens? Obviously, Chris wasn’t stupid. He obviously had a lot going on inside his head. It also appears that he kept a lot of that to himself. What if he had found someone to share those thoughts with? What if he had some type of outlet to deal with those thoughts? What is “wanderlust”? Was Chris rebelling? Was he protesting? Was he trying to find himself? Was he trying to reconcile his past relationships in his head? Or was it nothing so complex as that? Was he simply just “being” and going where that led him? I’ve known people who I’ve thought could seriously live anywhere and with nothing and they would be happy…..material items mean nothing to them. They don’t worry about tomorrow….they know it will come regardless of how you prepare for it…and they know that it usually takes care of itself. I’ve often admired their courage to set forth and not know where they shall end at the end of the day. Staying in hostels or sleeping under the stars…..I’ve also though that there was a bit of madness there as well 🙂 I’ve wondered if they are running from something. Or just simply living life as they *want* to live it…. But take it a step further….what if those people had never found that outlet in the first place? Would their search for it be termed “wanderlust”? Face it, you see someone a bit unkept standing on a street corner and *if* you see them, you might make an automatic assumption…..if you see a young guy standing on the beach going, “Whoa, Dude”, again an assumption is made…. I’m pretty f**king sure the co-workers of Chris McCandless’ at McDonalds who jokingly offered him a bar of soap to get rid of the smell were making assumptions as well. However, they were wrong. Turns out that he was probably the most educated person there. He wasn’t stupid and unable to get work somewhere else. He wasn’t unmotivated. His family was probably more “well-to-do” than any one else’s. Chris didn’t have to be alone. Chris didn’t have to be flipping burgers at McDonalds. He *chose* to…..
I’m not saying that Chris was a closet genius and he would have changed the world. I’m only saying that these are the thoughts that ran though my head as I read this book. It just all reinforced what I already know….We ALL have these *things* going on inside our head. Some of us just mask them better…..or find a way to deal with them…..no one ever knows everything that goes on with someone….even our loved ones…..we all have our secret thoughts and feelings….and sometimes motivations aren’t clear….even to ourselves…..
a little bit of kindness can go a very long way…..but so can a little bit of judgement…so be generous with your kindness and stingy with your judgement…. his books are excellent – I haven’t read this one yet, but Under The Banner of Heaven and Into Thin Air were both highly recommendable.